That Luang de Vientiane is part of the Tentative list of Laos in order to qualify for inclusion in the World Heritage List. "Thanks" to some last minute flight schedule changes by Lao Air I found myself stuck for a day in Vientiane while waiting for my flight to Pakse. I used the time to visit the national symbol of Laos, That Luang. Laos may be Communist on paper, but it's very much Buddhist in daily life. So it fits that the national symbol is not the workers' palace or a mausoleum of the dear leader but a buddhist stupa. I agree with Els that That Luang has only national importance and should not be inscribed. The level of craftsmanship and artistry leaves much to be desired and does not warrant an inscription. While the stupa dates from the 16th century, I also feel that many parts are not original and rather recent additions. However, with Unesco nowadays you never know. Having not been to Thailand I also don't have a reference point for this type of structure. Vientiane as capital is connected to all parts of Laos by bus. Be advised that while distances in Laos aren't that large, travel times are still high due to poor road conditions. The international airport offers domestic flights to the big cities of Laos as well as some international flights. Near Vientiane you can also cross into Thailand via the Friendship Bridge. South of the border you will find a Thai world heritage site, Ban Chiang. I was looking into how to get there, but couldn't figure it out. To get to That Luang from the hotel area (on the banks of the Mekong) you can take a tuk tuk or cab. Or you do as I did and just walk. Crossing the roads is a bit of a challenge, though. As is the case in most of South Eastern Asia. And some sidewalks are in poor condition. But you get to see the Laotian Arc de Triomphe along the way. Vientiane offers only a few tourist sites of interest and I would recommend keeping your time in town short. While you are waiting for your connecting flight or bus, enjoy the great restaurants you will find in town. There are plenty of French Laotian fusion places, e..g. La Cage du Coq. 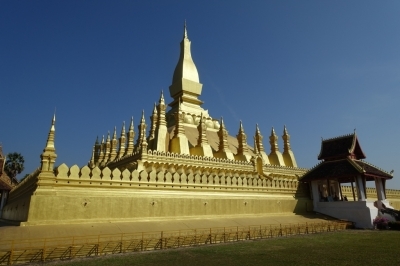 The Grand Shrine (Pha That Luang) of Vientiane is a huge gold-covered stupa. It consists of 3 levels, surrounded by a cloister, plus a 45 meter high spire. It's the most important national monument of Laos, and that's probably what lead to its spot on the Tentative List. It was built in 1566 over an old stupa holding a holy Buddhist relic. The stupa is located a few km's northeast of the city center of the capital of Laos - too far to walk in the heat. I took a tuktuk there. The driver suggested to wait so he could have the return trip as well - obviously knowing that a visit doesn't take long (and also of course preferring the tourist price for a ride). To an outsider like me it is a very weird object: an enormous glittering object under the radiating Laotian sun. Almost a golden spaceship. Entrance fee is 5000 kip (0,45 EUR). For that you can walk around the cloister and on the first level on the stupa. Chances on WH status are very low I think: it is mainly a monument of national importance.